IMPROVED PROFITABILITY…A NUTRITIONIST THAT UNDERSTANDS YOUR GOALS…TEAMWORK…this is what you can expect from the Crystal Creek® dairy nutrition team. Our team works with you to understand the goals you’ve set for your herd and partners with you to make those goals a reality. The Crystal Creek® Dairy Nutrition Model believes that nutrition programs should improve the profitability of the dairy producer in a sustainable manner. Our model is built on the principles of healthy animals and optimizing ruminant digestive function. Meet our experienced staff; they are here to help you meet your operation’s goals. Our nutritionists work with you to utilize your feedstuffs and maximize your operation’s efficiency and profitability. It is important to work with a nutrition team that understands every operation is different and each herd has its own unique set of goals. Our nutritionists pride themselves on their ability to listen to the needs of our clients and formulate a nutrition program that is customized for them. Crystal Creek® provides free ration balancing and nutritional consulting services with qualifying mineral purchases. Improved Profitability: Producers often see improved profitability as a result of reduced feed costs and improved herd health. Improved Herd Health: Less metabolic disease, improved reproduction, transitions, foot health and lower somatic cell counts. Improved Transition Period: Puts strong emphasis on the dry cows and the transition period. Better Body Condition: Cows consistently show better body condition and are ultimately more productive. 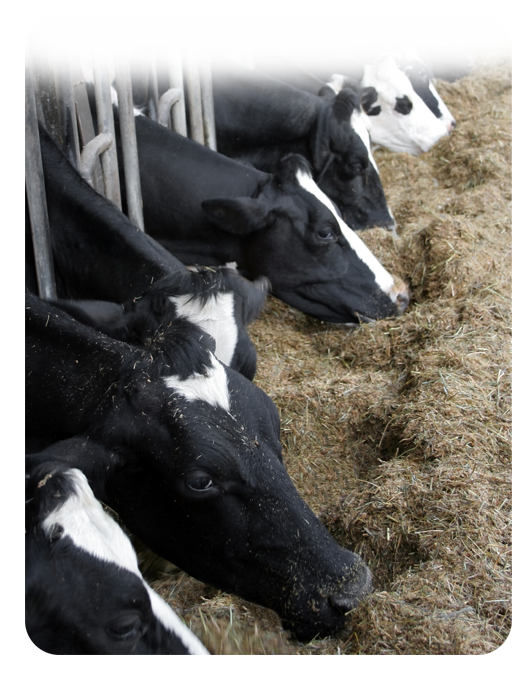 Lower Feed Costs: The CCDNM’s support of efficient digestive function, reduced use of additives (fats, buffers, ionophors, probiotics), lower grain rates and less supplemental protein all contribute to lower feed costs. Higher Dry Matter Intake (DMI): Can deliver a higher energy ration with less grain due to improved forage DMI. Improved Reproduction: Improved reproduction is typical when cows utilize their diet more efficiently and are under less metabolic stress. Lower Somatic Cell Count: Understands the principle that immune function is directly tied to nutrition. Improved Milk Production: The CCDNM’s goal is to increase profitability. Higher milk production can be a part of that formula. Higher Components: Herds that utilize the forages in the ration more effectively will often show an increase in milk components.